For our resident readers Villa Mercedes will need little introduction. 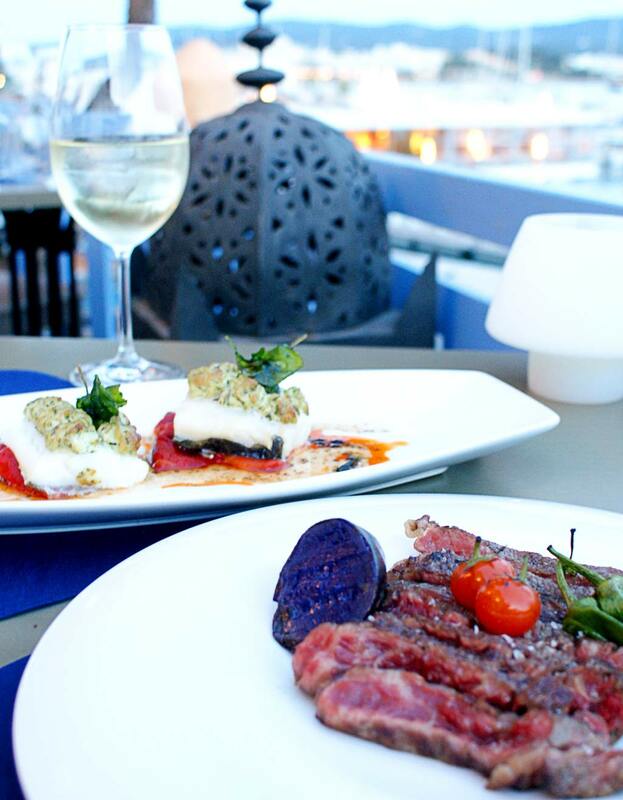 Those who have enjoyed a balmy afternoon on the staged terrace looking out over the clinking masts of San Antonio Marina, will not need me to set the scene of what is a favourite setting for many of us. 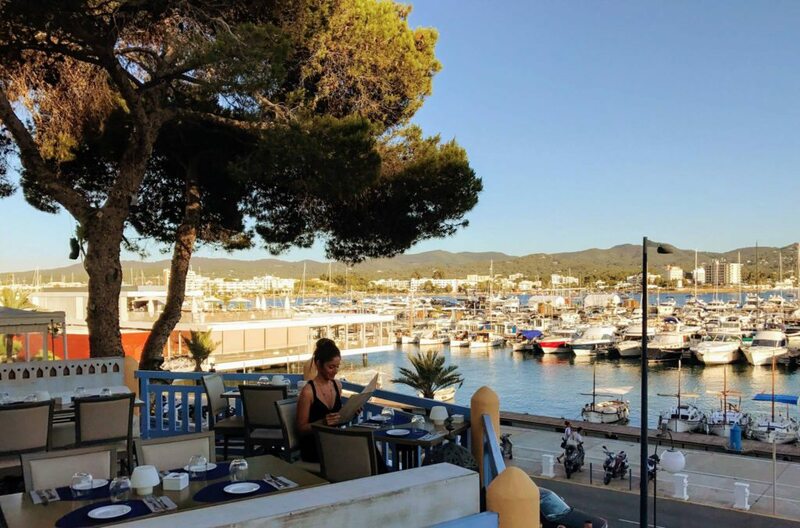 However for those new to or visiting Ibiza, let me add that the restaurant’s home is a charming turn of the century villa, located on the front line paseo (promenade) of San Antonio’s waterfront. Diners can choose between the chic art deco influenced interior, or one of the terrace tables dotted around its gardens. 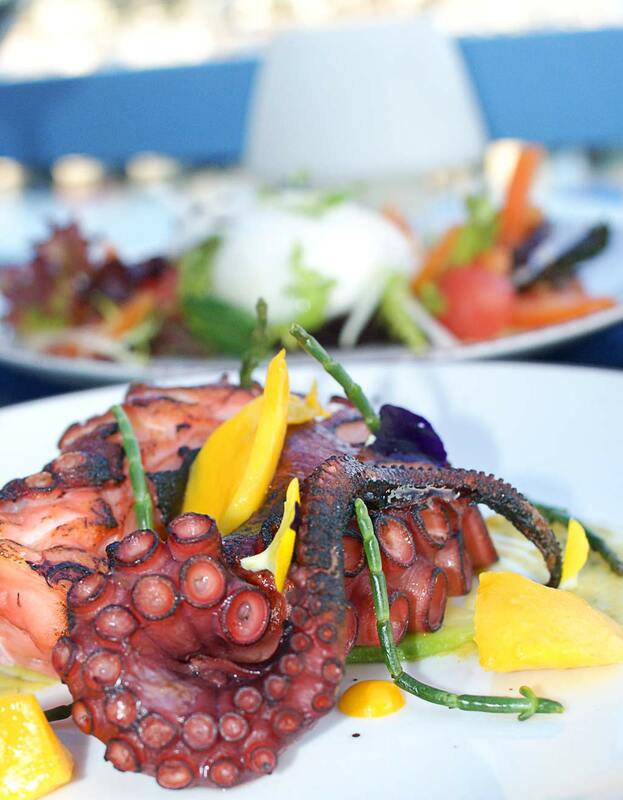 Villa exudes quality without any hint of pretentiousness, and perhaps the best recommendation I can give is to say that when we locals are thinking of a dinner for any special occasion, Villa Mercedes will be among the few always at the top of our list. It only occurred to me recently that in all the times I have dined at Villa Mercedes, it has always been for a long leisurely afternoon. Though never a conscious decision to dine by day, there are several reasons that may be behind that fact. Firstly, our son loves it. You wouldn’t feel comfortable with a 7 year old (probably 3 on his first visit) in many restaurants serving Villa’s quality of food but here you do. Secondly, as I am often charged with photography, and am what could be described as best an enthusiastic amateur, I have taken the easy option of God’s own lighting. Third, simply because afternoons at the Villa are such wonderful times. On this occasion we decided to mix it up and go for an evening dinner, particularly looking forward to the live music that comes with it. We dined on Sunday 28th of May, the first night the Balcony was open, and we were pleased to accept the offer of what must be one of the best seats in the house. A people watcher’s dream with even better views than those on the terrace, plus the added cabaret of colourful characters seen from our candid vantage point as the sun slipped down in the sky. Though the balcony was new, we have learnt to put ourselves in the hands of Villa’s Chef Ramiro Valdez several times before. 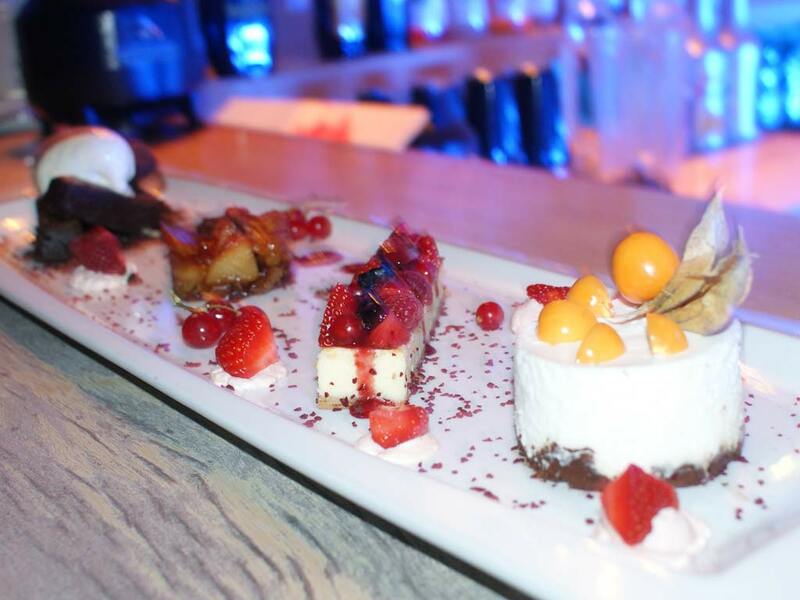 Why fret over selection when you can opt for the tasting menu and leave it to Ramiro to serve up his finest fayre? Octopus has been a firm favourite in our house ever since we tricked our son into eating it on the pretence it was sea chicken. The Mercedes marriage with mango is inspired. You expect salt and cracked pepper, but the coriander shoots and flowers were a nice touch. 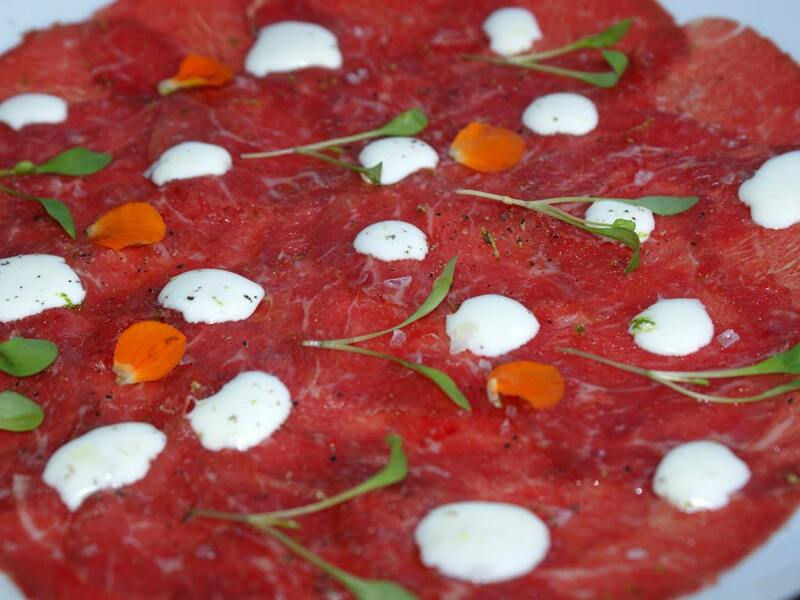 The Tallegio cheese emulsion cream was unexpected – intense, deep and gorgeous. Burrata Salad, tomatoes, onions & avocado cream. 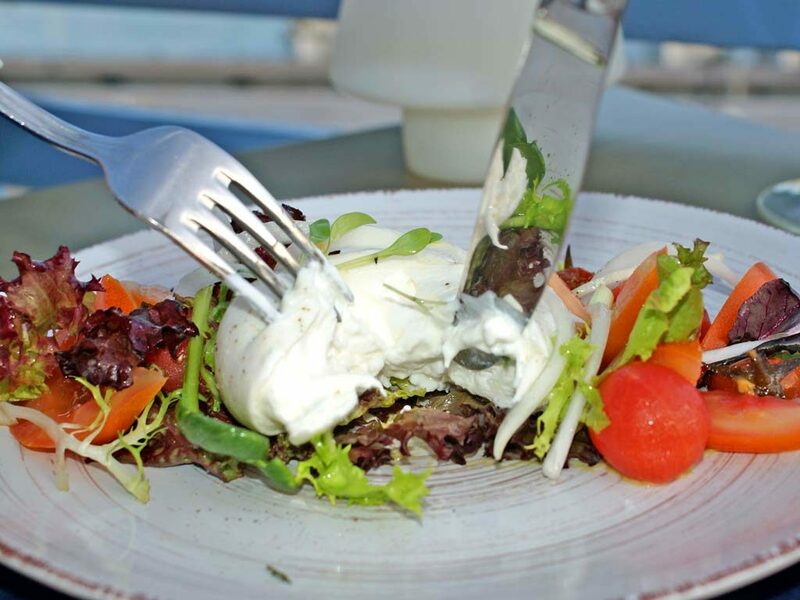 The Burrata Mozzarella and confit tomatoes were ‘stand out’, a taste sensation, an amazing burst of flavour. I would have happily settled down to a plate of these alone. The entrecote was not entrecote. Apparently we were being given the tourist name as it is a cut unfamiliar to away from Ramiro’s South American heritage. We forgot to check its real name however it certainly deserved the platinum demarcation. 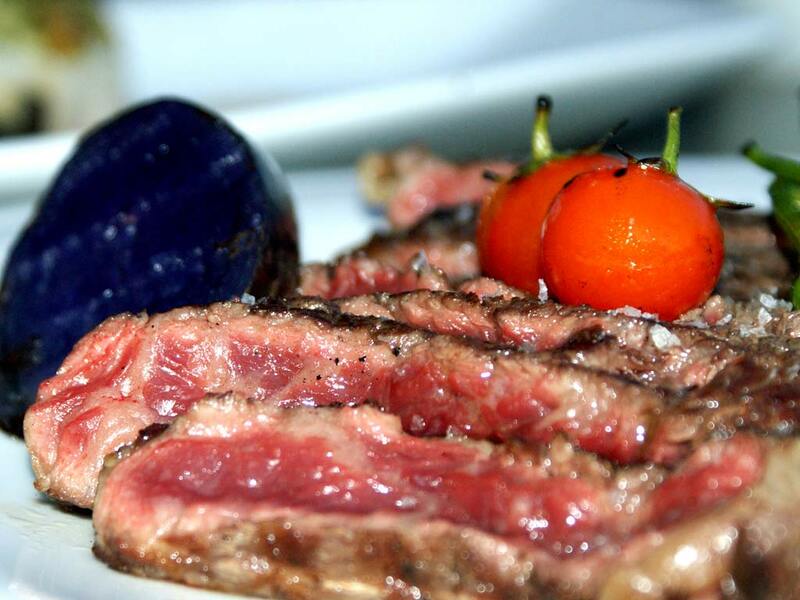 Oh so melt in the mouth, cooked and seasoned superbly. Not actually on the menu for another week or two (another perk of going for the tasting menu). After a food break, a much needed break, we relocated down to the cocktail bar area of the main terrace to enjoy our desert and a cocktail with the live music that is a very frequent feature of Villa Mercedes summer nights. 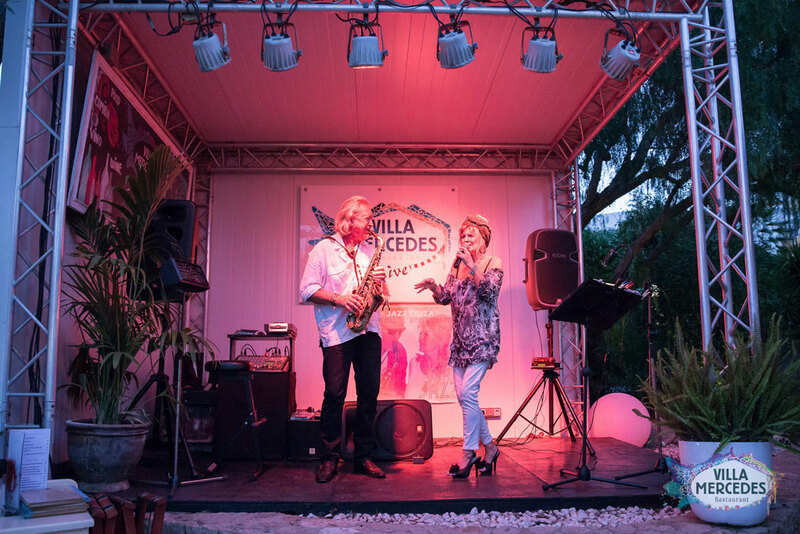 The schedule right now is Flamenco on Thursdays, the very popular Paco Fernandez on Fridays, a DJ Saturdays, and tonight’s Jazz by well known Dutch/Ibizan husband and wife duo Peter and Winni’s Jazzbiza. As we were settling down to enjoy their repertoire of mellow ballads and swing with a gorgeous ’Coco Rico’ cocktail, something rather wonderful happened. Something wonderful, but also rather scary. Crunchy praline with coconut mousse, A rich dessert for those who have a sweet tooth. Villa Mercedes, simply superb, as it always is.